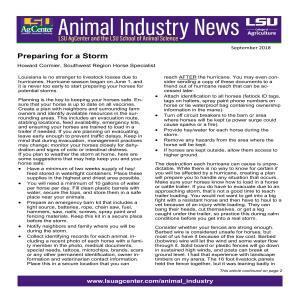 Increased stress placed on horses from devastating floods across Louisiana has resulted in an increased number of neurologic cases treated by the LSU School of Veterinary Medicine. General neurologic symptoms in horses include loss of appetite; depression; fever; weakness or paralysis of the hind limbs; muscle fasciculation or muzzle twitching; impaired vision; ataxia (incoordination); head pressing; aimless wandering; convulsions; inability to swallow; circling; hyper-excitability; and coma. Pinpointing the exact cause of neurologic symptoms can be difficult. The symptoms can be very similar no matter what the cause or disease. Excluding trauma to the central nervous system, the most common cause of neurological symptoms in horses is Equine Protozoal Myeloencephalitis (EPM). However, several other conditions can cause neurologic dysfunctions. These include: parasites, infectious diseases, and ingestion of toxic substances. Flooding may cause horses to be exposed to pastures contaminated with parasites or being relocated to pastures not previously intended for horses. If horses begin sharing grazing areas with displaced wildlife, neurological disorders may increase from parasites in those pastures and lowered immune system caused by stress. Equine Protozoal Myeloencephalitis (EPM) is caused by the protozoal parasite Sarcocystis neurona. The parasite enters a horse that eats feed or drinks water contaminated with opossum feces. Once ingested, the parasite migrates through the horse’s intestines, through the bloodstream and across the blood/brain barrier where it begins to attack the central nervous system. From 60% to 70% of all treated horses will return to normal activity level. Verminous Myelitis is caused by the parasite Halicephalobus gingivalis. This parasite likely enters the horse’s bloodstream through the mucus membranes of the mouth where it then migrates to the brain, causing central nervous system inflammation, which will cause neurological symptoms to occur more frequently on one side of the body. Recovery and treatment is varied and often unsuccessful. Stressed horses have a decreased immune system, making them more susceptible to viral infection. Mosquito-borne Encephalitis occurs when flooding creates a perfect environment for the mosquito population to increase. Although no specific treatment is available for any of the mosquito-borne neurological disorders, vaccination has been proven to prevent 99% of all infections. Veterinarians recommend if you live in an area with a high mosquito population, vaccinate for these viruses twice a year. West Nile Virus (WNV) is spread by mosquitos. It causes infection of the brain and spinal cord and their protective coverings. Although the majority of horses infected with WNV will not show any symptoms, this disease has no specific treatment. WNV has a 30% fatality rate, even with supportive care. Eastern & Western Equine Encephalomyelitis (EEE & WEE) are viruses spread by mosquitos that cause infection and inflammation of the brain and spinal cord. No specific treatment exists, and death will occur in 90% of horses within two to three days after the onset of neurological symptoms. Rabies is a virus spread by the bite from another infected animal. In horses, the virus can be present for two to nine days prior to any neurological symptoms appearing. No treatment is available for this fatal virus. Exposure to displaced wildlife may increase the chance of horses contracting this virus. Equine Herpesvirus-1 (EHV-1) is a respiratory virus, spread by infected horses. Although horses are commonly vaccinated for some forms of herpesvirus, EHV-1 has no specific vaccine and can cause abortions and neurological dysfunction. Neurological symptoms are caused by injury to the blood vessels of the blood/brain barrier. Although no specific treatment is available for EHV-1, supportive care may aid in recovering mildly affected horses; however, reports of full recovery are varied. Evacuating horses to emergency shelters with improper biosecurity techniques in place also can increase the chances of exposure to a number of viral infections. Natural disasters cause a number of issues when it comes to ingestion of toxic substances. 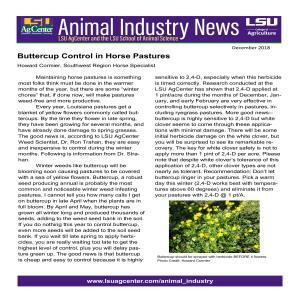 Reduced availability of quality forage will force horses to consume toxic plants. It is important that horses do not ingest moldy, rotten or contaminated feed. Barns, pasture, water and hay sources should also be checked for mold and dead animals. Botulism is caused by the toxins created by the bacterium, Clostridium botulinum. Typically, horses come in contact with the bacterium through feed or water contaminated with rodent droppings or small animal carcasses. This is especially common in processed hay pellets or cubes. Botulism causes various neurological symptoms and can be extremely difficult to diagnose. Treatment options do exist, but must be given early to ensure full recovery. Equine Leukoencephalomalacia, also called Moldy Corn Poisoning, is a neurological condition caused by feeding moldy corn over the course of several weeks. The fungus causing the mold produces toxins and can cause severe neurological dysfunctions. No effective treatment options other than prevention are available for this fatal disorder. Hepatic encephalopathy is a neurological disorder caused by severe liver damage; symptoms will not be evident until 60% to 80% of liver function is lost. Liver damage in horses is typically caused by ingestion of some type of toxic plant. During natural disasters and relocation, quality forages may be scarce, causing horses to resort to eating less-than-palatable plants. Treatment options are available; however, full recovery is unlikely. Natural disasters are stressful for horses and owners in many ways. It is important to ensure that proper health, management and biosecurity measures are taken to protect horses during the recovery period. Although exposure to all disasters cannot be prevented, horse owners must have a plan to address vaccinations, parasite control, quality feed availability and safe living spaces to increase overall survival rate and minimize loss. If you suspect your horse may be suffering with neurological symptoms of any kind, contact your local veterinarian immediately. Henneke, C., Jespersen, A., Jacobsen, S., Nielsen, M.K., McEvoy, F., and H.E. Jensen. 2014. The distribution pattern of Halicephalobus gingivalis in a horse is suggestive of a haematogenous spread of the nematode. Acta Veterinaria Scandianavica 56:56. Johnson, A.L., McAdams, S.C., and R.H. Whitlock. 2010. 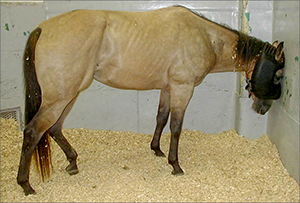 Type-A botulism in horses in the US: a review of the past 10 years (1998-2008). J. Vet Diagn Invest 2010; 22(2): 165-173. The Merck Manual. Disorders of the Spinal Column and Cord in Horses. 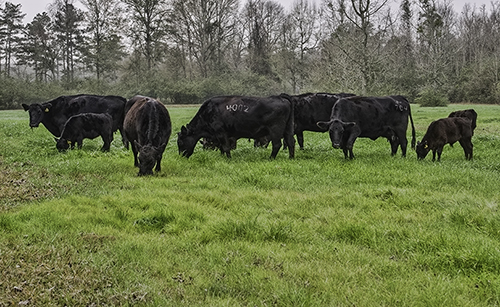 Louisiana is a cow-calf state, and the profitability of any cow-calf enterprise is directly related to the reproductive performance of the cow herd, which, in turn is reliant upon the nutrition provided to the herd throughout the year. The beef producer must consider each cow an employee, and to turn a profit, each cow must do her job and produce a calf every year. For this to materialize, the nutritional requirement of each cow must be met. In this instance, one size does not fit all and younger cows, especially two-year olds, have higher requirements than mature females due to the added requirement for growth coupled with lactation. One must understand that cattle have the ability to prioritize the use of available nutrients in a specific order. Those being body maintenance, fetal development, lactation, growth and finally breeding. If the cow’s nutritional requirement is not met, the first thing to suffer is reproduction and subsequently the boss’s bottom line. Research has shown it costs the same to maintain a cow that produces a calf in a given year as one that does not. Remember, the cows are working for you, but you have to provide them with the tools they need to do their job. So, how do you know if you are providing what is needed? In short, the answer is body condition, or the percent of body fat. The cow “lays” down fat in times of excessive nutrient availability from front to rear and from top down, while in times of nutrient restriction, fat is mobilized in the reverse order and once body fat is depleted, muscle is metabolized. The amount of condition a cow carries will not only affect her performance but also that of her calf. Poor body condition has been associated with increased post-partum interval, weak calves at birth, low quality and quantity of colostrum, reduced milk production, increased calving problems and lower weaning rates. Therefore, to assess the condition of beef cattle a nine-point body condition scoring system has been developed. Body condition scoring is based on visual appraisal of key bone structures for fat cover. These areas include the backbone, ribs, hips, pin bones, tail head and brisket. 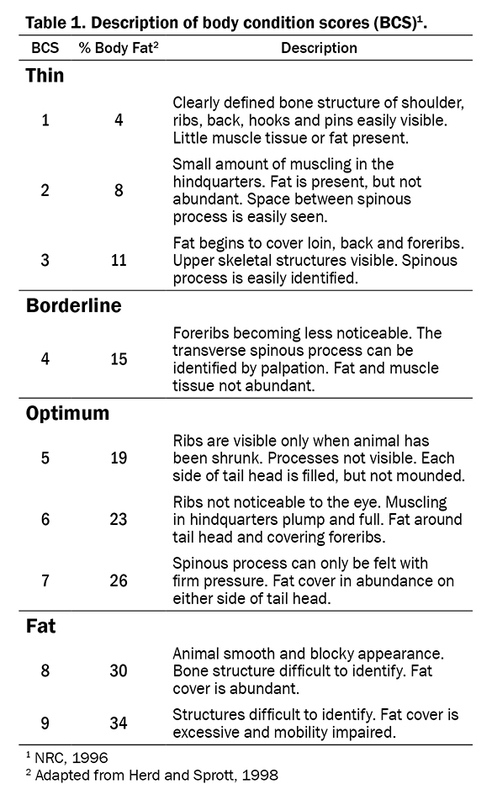 Each of these key areas are visually appraised and based on Table 1, the body condition score (BCS) can be determined. For producers that are not accustomed to assigning BCS, they should first work on separating cows into thin, moderate and fat groups without assigning an actual score, over time they will begin to associate the “look” of the cows to a BCS that can be consistently determined. Factors that should be taken into account when assigning a BCS are hair coat, cow age, rumen fill and stage of pregnancy. These factors should not affect the scoring, the BCS is an indicator of the amount of fat cover or condition your cattle exhibit. As one becomes accustomed to assigning scores, links to productivity will become evident and management strategies can be altered. 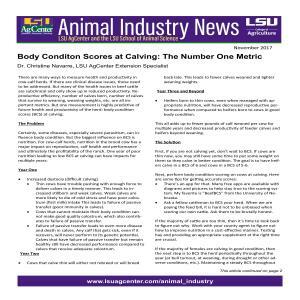 Assigning scores to cows should be an ongoing process and as confidence in the ability to assign a BCS increases it will almost become second nature to mentally assign scores to cows every time animals are checked. However, recording BCS throughout the year will reveal changes in the cow’s condition as they progress through each production phase and allow for alterations in the nutritional management plan as needed. For the producer to economically impact the BCS of cattle, all females should be scored no later than 90 days prior to the calving season. After calving, when the cow is in early lactation, it becomes economically prohibitive to increase body condition for the impending breeding season. However, there are other key times throughout the year when scoring is recommended. First is late summer or early fall when cattle are utilizing available forage to meet nutritional demands, at this time, the nutritional status of the herd can be impacted by decisions on early or strategically weaning so cows can “bounce back” or supplementation can be considered. At weaning, scoring at this time offers the producer the opportunity to determine which animals are “hard keepers” and based on calf performance culling decisions can be made. 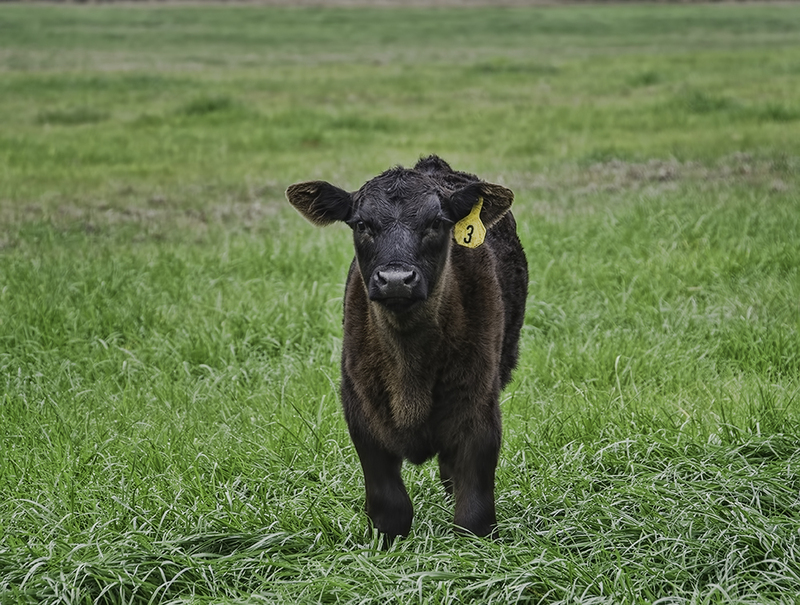 To determine if cattle are “bouncing back”, scoring at forty-five days post weaning will provide an indicator if the nutrition being provided is adequate. Ninety days prior to calving, as stated above, is the last chance to economically impact body condition. At this time cows should be on track to calve at a BCS of 5 to 6 and heifers a BCS of 6. Scoring females at the beginning of the breeding season will give the producer an indication of the impact of nutritional management decisions up to this point, but in reality, by this time it is too late to make up large differences in body condition that would impact the outcome of the upcoming breeding season. 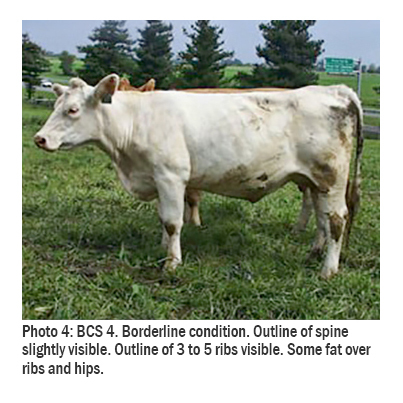 There is no substitute for good management and there is no “silver bullet”, but the ability of the producer to assess the body condition of his cow herd can drastically improve the decision making process. This is a practice that costs nothing, but can pay huge dividends in the long run. So the next time you ride through your cattle, practice assigning BCS. Remember, take care of your employees and they will take care of you. Herd, Dennis B.; Sprott, L. R. (1998). 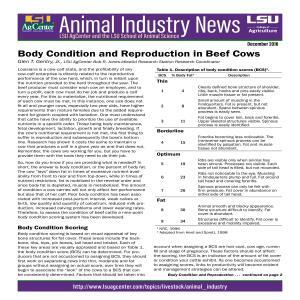 Body Condition, Nutrition and Reproduction of Beef Cows. Available electronically from http : //hdl.handle .net /1969 .1 /87723. NRC. 1996. Growth and Body Reserves. 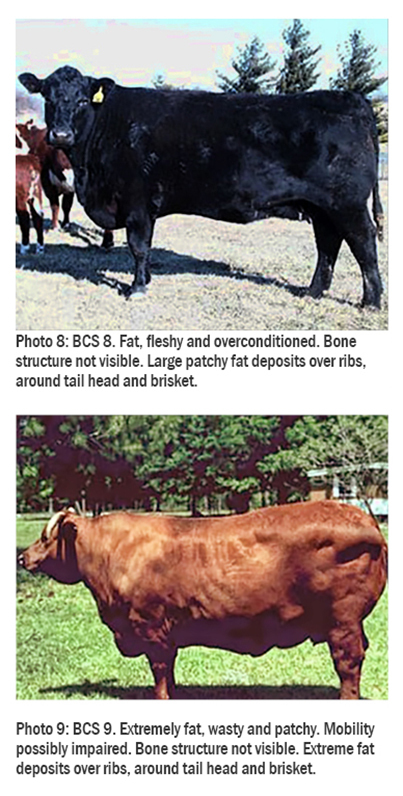 Nutrient Requirements of Beef Cattle. 7th ed. Washington, D.D. : Natl. Acad. Press. Quality Assurance Programs, like BQA, are rooted in livestock producer’s belief in doing the right thing. The judicious use of pharmaceutical products is essential to producing safe, high quality food as well as maintaining animal health. Misuse of animal pharmaceutical products may break state and/or federal laws and threaten their future availability. 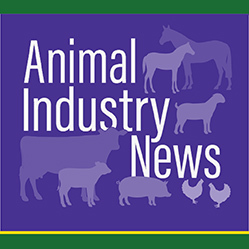 With the new FDA Veterinary Feed Directive Rule set to go into effect on January 1, 2017, now is a good time to review old regulations to make sure we are doing what’s right and what’s legal. Just like your physician needs a relationship with you to prescribe medicine, the same is true for veterinarians. The veterinarian-client-patient relationship (VCPR) is essential for veterinarians to not only do what is medically and ethically right for animal health, but also to protect their license. The VCPR is dictated by both federal and state law (Louisiana Veterinary Practice Act). As responsibility for pharmaceutical use oversight shifts more towards veterinarians, so does the liability. Cooperation is essential in doing what’s right. As you will see from the following summary, the legalities are complicated, confusing, and continually changing. That is why you should talk to your veterinarian before administering any pharmaceutical product to any animal, but particularly any animal that is considered a food product. Take a look at the examples provided below to make sure you are doing what’s right. Veterinary pharmaceutical use is governed by the Food and Drug Administration (FDA) at the federal level and the Louisiana Board of Veterinary Examiners via the Louisiana Practice Act at the state level. The Environmental Protection Agency (EPA) approves some pesticides for animal use (fly tags, pour-ons for lice, flies, etc). Prescription (Rx) and Veterinary Feed Directive (VFD): For use only by or on the order of a licensed veterinarian within the context of a veterinarian-client-patient relationship (VCPR). Over-the-Counter: Products available for purchase by laypersons that do not require a prescription. FDA considers cattle, swine, sheep, goats, poultry, rabbits and fish food animal species (refer to FDA policy for complete list). While owners may have these species as pets, when it comes to pharmaceutical use, they must be treated as food animals. Label use is exactly what it implies-using a drug exactly as it is labeled including species, indication, dose, route, frequency and duration of administration. ELDU is defined as any use of a drug in an animal in a manner that is not in accordance with the approved labeling. This includes but is not limited to use in species not listed in the labeling, use for indications (disease and other conditions) not listed in the labeling, use at dosage levels, frequencies, duration or routes of administration other than those stated in the labeling, and deviation from labeled withdrawal times based on these different uses. What are some examples of prohibited extra-label drug use? Use of OTC human products, even topical ointments that seem harmless, can result in drug residues in food. Do not use unless directed by a veterinarian. Must select a product that is labeled for anaplasmosis and use exactly according to label directions for dose and administration as directed on a VFD. In the simplest way, annual costs can be described as the total dollar input necessary to run a cattle operation for a year. EVERY input cost!! For many reasons, cost of production remains an illusive figure for most. Many producers seriously underestimate the total dollar input, giving a false impression about net returns. 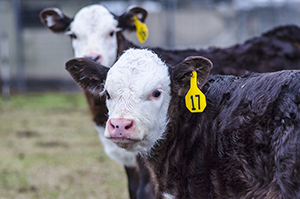 The ability to estimate production costs accurately is as important as a restricted breeding (calving) season in herd management and financial evaluation. Costs are generally expressed on a per cow basis. Research reports and synthesized budgets generally show the average cost of production per cow in the U.S. has increased 225% or nearly 5.6% annually over the past 15 years (Source: LMIC). Each operation is different, so this estimate will not apply to all situations. The point is, a thorough record of all expenses, not just the out-of-pocket expenses, should be kept. Feed, fertilizer and fencing seem logical, but what about four-wheelers, horses and horse feed, water lines, wells and pumps, electricity, equipment, trailers, etc. Income from the sales of products (bulls, cows, calves, yearlings or fat cattle, and excess hay) determines the usual source of gross returns. 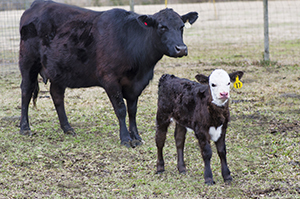 In Louisiana, income from calf sales represents the largest portion of returns. 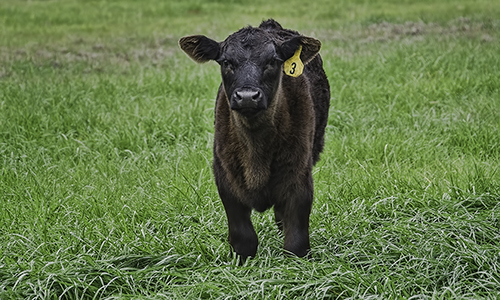 Weaning rate, weight and price at sale time are the most important factors affecting returns in a cow-calf operation. Quality and genetic make-up are also considerations in fixing prices. The concept of breakeven price should be understood. Breakeven is a figure resulting from the ratio of total cost of production per unit and total product available for sale per unit. Know and analyze your production costs. Particularly focus on pounds of calf sold per cow exposed and cost per pound of calf marketed. Decide on an obtainable goal for cost of production per pound of calf sold. Keep detailed production records. Record keeping and planning is an important management function for any business, particularly one as unpredictable as the cow-calf business. However, good record keeping and planning will not lead to improved profits unless the records are used to identify management opportunities, and cost savings. Knowing the cost of production is a critical aspect of a marketing plan. 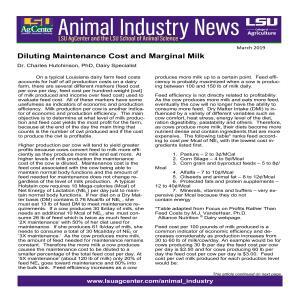 Manage and market cull animals effectively. Pay attention to the basics. Solid nutrition, forage management, health, reproduction, genetics and management programs are still the key to sustainable and profitable beef production. The beef industry has enjoyed record profitability in recent years. While the ride has been enjoyable, the industry has witnessed remarkable change in the opposite direction in a short period of time. Now is the time to gear up for the long-term and take the necessary steps for future profitability and sustainability. As these market changes take place, the gap will widen between the most and least profitable. Being a low-cost producer has always been important, and cost control will always be a defining component of a successful beef enterprise. However, practices which can be documented, add value, and have favorable consumer impact provide the most opportunity to increase returns and stay in business. Since the tremendous increase in the production of ethanol starting in 2011, a byproduct of the ethanol industry, dried distillers grain with solubles (DDGS), has become readily available. The traditional DDGS is high in protein and energy which makes it a very good feedstuff to substitute for some of the corn and soybean meal normally in the diet of dairy replacement heifers. The one drawback to DDGS is the high fat content (10-15%) on a dry matter basis. This has resulted in DDGS only be incorporated in dairy heifer rations at the rate of about 20% or less of the diet dry matter. However, the development and increasing availability of reduced-fat distillers dried grains with solubles (RFDDGS) could allow them to be incorporated at much greater proportions. Previous research on heifer growth with RFDDGS has resulted in heifer growth being maintained; thus demonstrating that RFDDGS fed at the inclusion rate of 20% of the diet dry matter (DM) is a good feedstuff for dairy heifers. Since the fat level is reduced in RFDDGS, this raises questions about how replacing energy and protein from forage with energy and protein from RFDDGS affects growth performance and what is the optimum or maximum dietary inclusion. A study at South Dakota State University was conducted on 48 Holstein heifers for 16 weeks starting at 199 days of age. The treatment diets consisted of 30%, 40% or 50% RFDDGS and hay along with a mineral mix fed at the rate of 2.65, 2.50, and 2.35% of body weight on a DM basis for 30DG, 40DG, and 50DG, respectively to have similar intakes of crude protein and energy among treatments. The results of the study demonstrated that feeding diets with 50% inclusion of RFDDGS did not compromise dairy heifer growth. 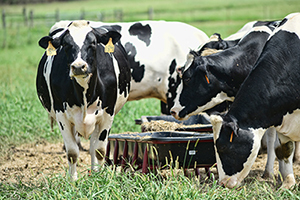 Limit-feeding diets with greater inclusion rates of RFDDGS improved gain to feed ratios while maintaining frame growth without increasing body condition score. Therefore, replacing forage with RFDDGS does not negatively affect heifer growth performance. 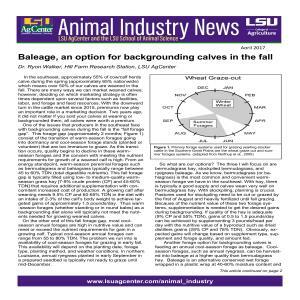 Adapted from an article by Jill Anderson in Dairy Herd Management Daily on October 20, 2016. 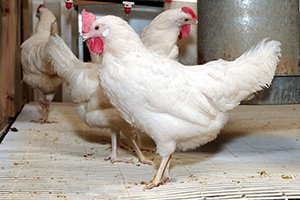 The total economic value of poultry to the state is $1.6 billion. 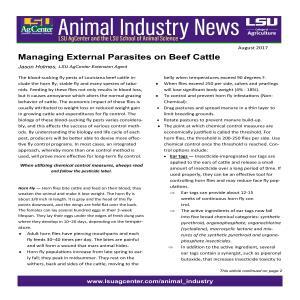 LSU AgCenter is committed to supporting this valuable industry through its research and extension programs. There is an AgCenter team that is serving as poultry liaisons. Jason Holmes, Union Parish Extension Agent is the point of contact for all poultry outreach programs. Steve Borel, West Baton Rouge Extension Agent, is serving as the state livestock show poultry superintendent. Dr. Janet Fox, 4-H Youth Department Head, will provide direction for the 4-H poultry contests. The Hill Farm poultry demonstration house research is under the leadership of Dr. Bill Owens. A poultry research source is also Gerry Romero at the Central Stations facility. 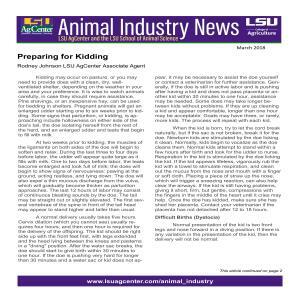 Professor Emeritus Dennis Ingram is the poultry educator for the LSU School of Animal Sciences. Gerry Romero is also an educational resource. The School of Animal Sciences and the College of Agriculture (COA) is committed to poultry education and will continue to offer 6 courses related to poultry (management, production and judging). Dr. Elzer, the interim School director, just received a $7,000 grant from USPOULTRY, entitled, “Industry Education Recruitment.” This grant will be used to educate students about the potential careers in the poultry industry in conjunction with the COA’s efforts to enhance interns in the industry. These funds will support FFA or 4-H programs, expenses for industry tours. 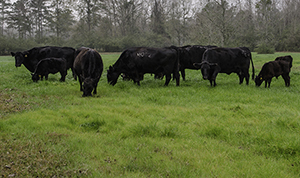 Poor grazing management often results in weakened plants, slow pasture growth and poor forage quality, especially if the pasture is under fertilized. Old forage becomes tough and unpalatable and cattle eat less and waste more. What they do eat is poorly digested. The end result is poor cattle performance. A sound grazing approach should promote fast plant growth, high forage quality and good animal performance. Even high quality winter pastures need good grazing management. Initial Grazing: One of the more important decisions about winter grazing facing a cattleman is when to start grazing the new pasture. Seedling size, soil firmness and stand thickness should be considered before turning the cattle into the field. Seedlings should be allowed to grow for a few weeks to permit development of a good root system and sufficient leaf area for rapid photosynthesis. This will permit storage of food reserves for regrowth. Generally speaking, small grain or ryegrass seedlings should not be grazed before they are 6 to 8 inches tall. When plants reach these heights, the field should be examined to determine whether the soil is firm enough to support grazing and whether the plants are firmly anchored in the soil. Fields that were prepared by plowing or deep disking will likely remain soft for some time after planting. If cattle are turned in too early, bogging may be severe and whole plants may be pulled out of the loose soil during grazing. When grazing is delayed too long, results can also be undesirable. Seedling growth can become excessive, causing lodging. Much of the forage will then probably be lost to trampling and soiling. Plants may also fail to tiller or thicken up the stand if they aren’t grazed and regrowth may be slowed. To avoid these problems, grazing should be considered whenever plants begin to fall over and the seedbed is firm. Stocking Rate: Once grazing begins, pastures should be watched to prevent overgrazing during the winter. Seedling regrowth is usually slow following grazing in cold weather and is very slow if plants are overgrazed. Plants weakened by overgrazing are susceptible to freezing injury and the stand may be lost in the winter. To prevent damage from overgrazing, cool-season annual pasture plants should not be grazed below an average stubble height of 2 to 3 inches during the winter. Well fertilized, fast growing winter pastures should support about 600 pounds of animal per acre (one 600 pound animal, or two animals weighing 300 pounds, etc.) as an average for the season. Slower winter growth and fast spring growth should be considered in planning your grazing program. When pasture growth is inadequate to support your animals, you should supply supplemental feed to carry them until grazing becomes more plentiful. Limited Grazing: Limiting grazing to a few hours each day or grazing only one day of each two or three days is a good way to stretch a short supply of high quality grazing. It also reduces trampling and soiling losses. Hay or other supplemental feed would have to be used to make up the remainder of the nutritional needs of the cattle. The major benefit of such a program is that high quality grazing is used to very efficiently meet most of the nutritional needs of the grazing animals. Regardless of when you start grazing and regardless of which grazing system you use, cattle should be removed from pastures that become wet enough to cause bogging or sinking of the cattle hooves into the soil. Failure to do so can mean pasture damage and even stand loss. Winter pasture is too valuable to manage it poorly. If you have any questions regarding winter grazing management, contact your local Extension agent.